Almost a month before I pack a crate of artworks to send off for public consumption, I fall quickly into the usual doubting dip. A moment of “what am I doing?”, “will anyone benefit from this?”, “have I been clear?”. After over 20 years of an embrace and denial dance of making art I still remain privy to the pangs of massive self doubt. 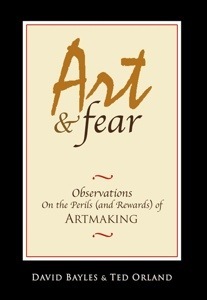 So last week I bought, and today just completed the book “Art & Fear, Observations on the Perils (and Rewards) of Artmaking” in the hopes I could calm my inner critic. The book is small, written by two artists, and is written exactly for artists going through these awkward nadirs of making art. David Bayles & Ted Orland are two photographers living in Oregon and California respectively. The most salient and reliable point to fall back on for me, is the authors’ point that there is no part of human history that exists without art. There are points in human history that we’ve declared things useless, or certain technology obsolete. There is no period in human history that does not generate art. Phew.